Contactlab in collaboration with Exane BNP Paribas is focusing this new research on the question of who actually buys luxury goods products and where they come from. We leverage data from digital and physical retail to create an unprecedented set of analyses. We record the % of sales in every country, coming from domestic vs. foreign customers. Conversely, we ascertain where exactly in the world each nationality buys luxury goods products. 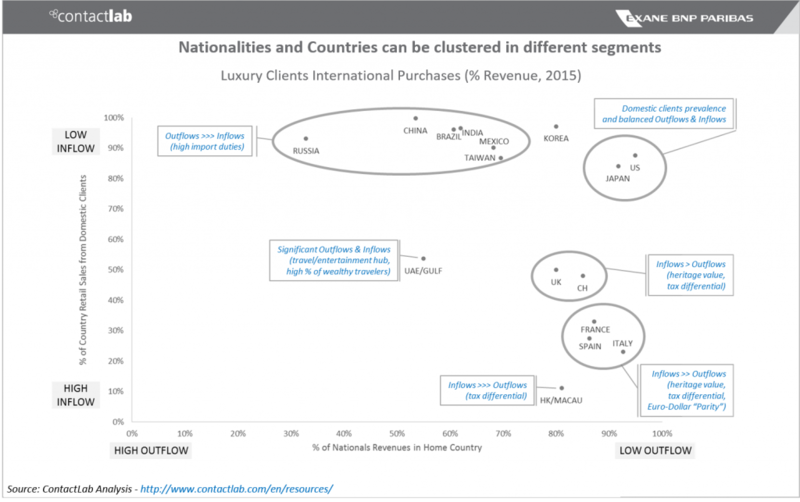 We track nationality vs. geography of luxury demand over the past three years. This is relevant, as 30% of luxury goods products were bought abroad in 2015, increasing 3,5% on 2014, with huge interchange between Asia and Europe. More than 90% of luxury purchases are carried out by Japanese and USA nationals in their respective countries – 80% when we look at South Koreans. Foreigners buying in Japan, South Korea and the USA only represent 5-15% of luxury goods sales in those markets, even if luxury goods purchases by Chinese nationals in Japan and Korea have risen in recent years on the back of favourable FX. French, Italian and Spanish consumers buy 85-95% of their luxury goods in their respective countries. By contrast, foreigners account for 70-80% of luxury sales in France, Italy and Spain. These countries have materially benefitted in recent years from a weakening EUR. The UK and CH are a little less extreme, with Swiss and British consumers buying 80-85% of their luxury goods in their respective countries. By contrast, foreigners account for 50-55% of luxury sales in Switzerland and the UK. Hong Kong & Macau are most extreme in benefiting from inflows. 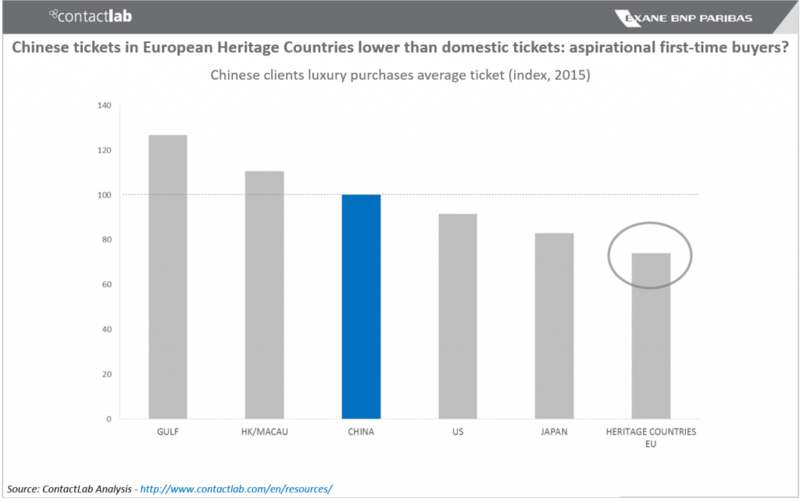 More than 80% of domestic luxury demand stays in Hong Kong & Macau. By contrast, foreigners represent 90% of luxury goods sales in Hong Kong & Macau. This despite Hong Kong & Macau falling from c.37% of incoming luxury goods sales in 2013 to c.25% in 2015, as Chinese demand has moved elsewhere, namely Japan, Korea and Singapore. 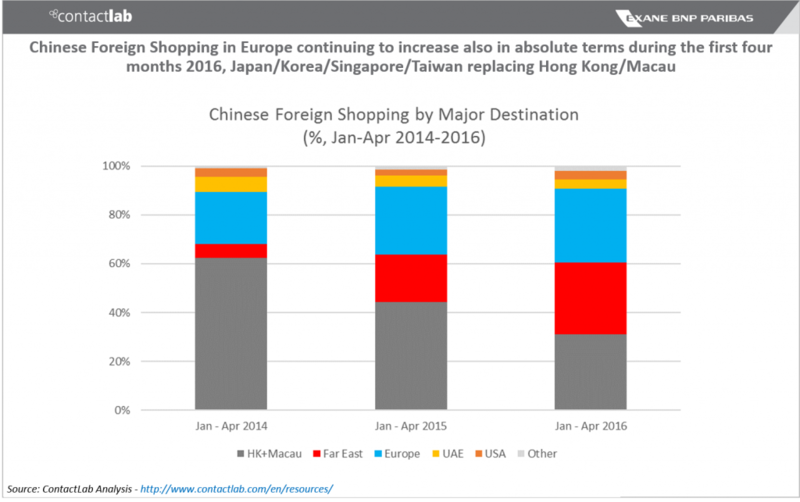 Chinese consumers were spending 70% of their luxury goods dollars in Hong Kong in Jan-Apr 2014 vs. 35% in Jan-Apr 2016. Russia is the most extreme: 2/3 of Russian luxury spend goes abroad, while inflows account for just over 5% of luxury sales in Russia. China is the second most extreme: c.40% of Chinese luxury goods purchases are made abroad – while China benefits from virtually zero inflows. Brazil, India, Mexico and Taiwan are in the same ballpark, though even less extreme: 2/3 of luxury spend stays at home, while inflows account on average for 5-10% of luxury goods sales in each country. Luxury goods sales in the UAE and the Gulf depend by c. 50% from oversea consumers. At the same time, UAE and Gulf nationals buy approximately 50% of their luxury goods abroad. Russians and Chinese nationals are the most important luxury goods spenders in the UAE, while Middle Eastern consumers spend a significant amount of their luxury goods dollars in Europe.